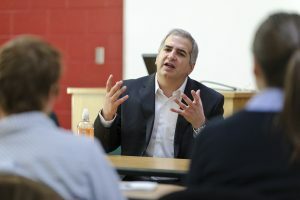 The Center for Journalism Ethics at the University of Wisconsin-Madison seeks nominations for the Anthony Shadid Award for Journalism Ethics. Now in its ninth year, the Shadid Award recognizes ethical decisions in reporting stories in any medium, including print, broadcast and digital, by journalists working for established news organizations or publishing individually. The award focuses on current journalism and does not include books, documentaries and other long-term projects. Entries should involve reporting done for stories that were published or broadcast in 2018. Individuals or news organizations may nominate themselves or others. The nomination window opened November 12, 2018. The Shadid Award includes a $1,000 prize and travel expenses to accept the award and discuss the reporting at an awards ceremony in spring of 2019. 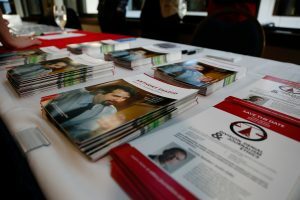 The Shadid Award is different from other journalism prizes in that it seeks to recognize the difficult, behind-the-scenes decisions reporters make in pursuing high-impact stories and in fulfilling their ethical obligations to sources, to people caught up in news events, and to the public at large. “Especially in a moment when trust in journalism is at a low ebb, it is essential to highlight the difficult choices reporters face in bringing important stories to light and the care they show for the people involved in their reporting,” says Lucas Graves, chair of the judging committee. A graduate of UW-Madison, Anthony Shadid died in 2012 on a reporting assignment in Syria for the New York Times. He won two Pulitzer Prizes for his courageous and insightful foreign correspondence. Shadid sat on the the Center for Journalism Ethics advisory board and strongly supported its efforts to promote public interest journalism and to stimulate discussion about journalism ethics. Deadline for submissions is: January 15, 2019. By entering this competition, you grant the Center for Journalism Ethics permission to use your entry as a positive example of ethical decision-making if your entry is judged a finalist for the award. If you are chosen as a finalist for the award, your nomination letter will be posted on our website. If there is anything within the nomination letter that needs to be kept confidential, please let us know. What is the Shadid Award for Journalism Ethics? The Anthony Shadid Award for Journalism Ethics recognizes outstanding application of ethical standards by an individual journalist or group of journalists. The award is named after Anthony Shadid, a University of Wisconsin-Madison alumnus and foreign reporter for the Washington Post and The New York Times. Mr. Shadid won two Pulitzer Prizes for his courageous and informed journalism. In February 2012, he died from health complications while crossing the Syrian border. When are nominations due to the committee? Yourself, a journalist, or a group of journalists who has exhibited outstanding commitment to ethical standards in the publication of important public journalism during 2016. Is there a cost to nominate someone? What kind of publications are not accepted? Documentaries and books are not accepted. We seek journalism published in any other medium, though, including but not limited to websites, newspapers, radio, television, and digital platforms. How are the nominations judged? The committee of journalists and editors uses the nominations materials provided to choose the finalists and awardee based on the thoughtfulness and responsibility of the journalists in resolving an ethical dilemma. What should I submit to the committee? A brief description of the story and a link to it online. The conflicting values encountered in reporting. The options considered to resolve the conflict. The final decision and the rationale for making it. How do I submit nominations? Send the nomination letter in PDF format to ethicsaward@journalism.wisc.edu. The committee expects to narrow the nominations to finalists in early February. The award includes a $1,000 prize and travel expenses to accept the award and discuss the reporting at a ceremony in spring of 2019. A graduate of the UW-Madison, Anthony Shadid died in 2012 while crossing the Syrian border on a reporting assignment for the New York Times. He won two Pulitzer Prizes for his courageous and insightful foreign correspondence. Shadid sat on the ethics center’s advisory board and strongly supported its efforts to promote public interest journalism and to stimulate discussion about journalism ethics. Shadid won the Pulitzer Prize for international Reporting in 2004 for his coverâge of the U.S. invasion of Iraq and the occupation that followed. He won the Pulitzer Prize again in 2010 for his coverâge of Iraq as the United States began its withdrawal. In 2007, he was a finalist for the Pulitzer Prize for his coverage of Lebanon and the war there with Israel. He has also received the Arthur Ross Award for Distinguished Reporting & Analysis onForeign Affairs (2009), the American Society of Newspaper Editors’ award for deadline writing (2004), the Overseas Press Club’s Hal Boyle Award for best newspâper or wire service reporting from abroad (2004) and the George Polk Award for foreign reporting (2003). In 1997, Shadid was awarded a citation by the Overseas Press Club for his work on “Islam’s Challenge.” The four-part series, published by the AP in December 1996, formed the basis of his book, Legacy of the Prophet: Despots, Democrats and the New Politics of Islam, published in December 2000. His second book, Night Draws Near: Iraq’s People in the Shadow of America’s War, was published in September 2005. Night Draws Near won the prestigious Los Angeles Times Book Prize for Current Issues and the Ron Ridenhour Book Prize. It was also a nominee for the National Book Critics Circle Award for General Nonfiction and was a New York Times Notable Book of the Year. His last book, House of Stone: A Memoir of Home, Family and a lost Middle East, was published in Spring 2012. In December 2010, Shadid gave the inaugural CJE ethics lecture. His powerful speech, The Truths We Tell: Reporting on Faith, War and the Fate of Iraq, conveys Shadid’s commitment to the highest ideals of journalism.